Hurricane Irma has significantly damaged Florida’s Orange crop, which should lead to an increase the price of Oranges globally. 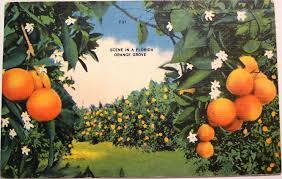 Image: Vintage Postcard – Oranges In Florida, licensed under a CC BY-ND 2.0 license. Orange juice futures soared amid the devastation left by Hurricane Irma, with the biggest jump in price in 16 months. Orange juice for delivery in November increased by 6.2% in price to US$1.45/pound, with cotton for delivery in December climbing by 4.2% to US74.88c/pound. Market concern for future supplies of oranges for juicing prompted some manufacturers to bump prices by 10%, with future rises expected. The state of Florida – America’s top orange producer and the world’s second-highest producer of orange juice – declared a state of emergency in the wake of widespread damage caused by Hurricane Irma earlier this month. Early estimates indicate losses of up to 70% of Florida’s orange crop, worth US$7 billion. With citrus crops almost ready to harvest, the impact upon the global prices will be significant, but exact figures won’t be available until the damage has been fully surveyed. Shannon Shepp – the Executive Director of the Florida Department of Citrus – says the storm damage will affect the industry on both a short and long-term basis. ‘Significant is not the right word. It’s somewhere between significant and catastrophic. And that’s a big word – I don’t use it lightly,’ she said. In addition to the short-term impact on the industry, many trees will need to be replanted, delaying any future harvests until the trees reach maturity. Orange growers have already battled through a ten-year battle to manage citrus greening disease, which turns fruit bitter and reduces crop yield. Since 2005, the disease has reduced Florida’s citrus crop by 70%. 90% of Florida’s oranges are used for juice. Estimates for this season had projected the state to produce 68.5million boxes of oranges and 7.8 mission boxes of grapefruit. With up to US$3 trillion of property in the path of the hurricane in Florida alone, experts estimate that the damage bill could be as high as US$300 billion. Winter crops including tomatoes, capsicums, wheat, corn, snap beans, cucumbers, strawberries and squash were also at risk of being damaged. Given many of these crops were recently sown, there is potentially still a window of opportunity for growers able to replant. However, it may be too late for sugar cane growers, who are due to start harvesting their crops at the beginning of next month. Florida is also the largest US producer of sugar cane, with this season’s crop estimated to be around 2.1 million tonnes. Aerial surveys to determine the extent of the damage are due to be carried out this week. Closer to home, encouraging recent rainfall events – predominantly on the east coast – have prompted ABARES to increase the annual wheat crop estimate by 1% to 24.19 million tonnes.